i have a tarpen electric trimmer ser/no pj14949x type 45p what is its value. i have a set of these if you are interested?working condition. Very interested to see this advert. I lived in Solihull as a child, where we had a large garden surrounded on 3 sides with a 7 to 8 feet Privet hedge, approx 150m in all, which dad used to cut by hand twice yearly! 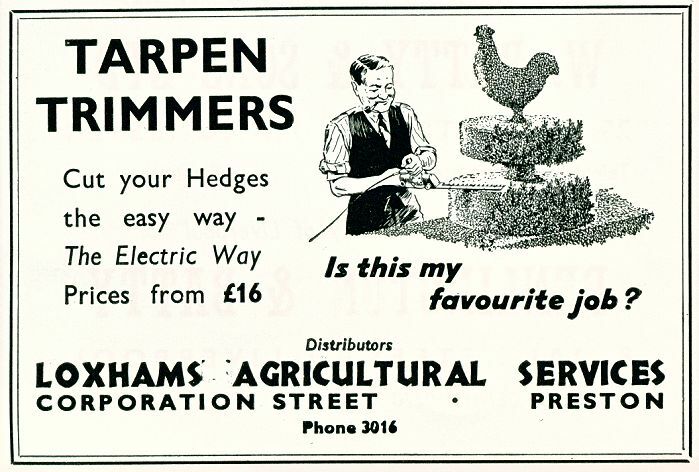 He purchased one of these 110 volt Tarpen Hedge Trimmers in about 1948/49 as I recall. It came with a heavy 250 to 110 volt transformer. I 'inherited' it after dad's death in 1985, and had to dispose of it as the main bronze worm gear in the gearbox wore out after about 60 years!! I was unable to locate a replacement, although found an agricultural firm in Herefordshire that still had a few spares from the days when they were stockists - a sad departure. I wonder how long my current replacement will last! !